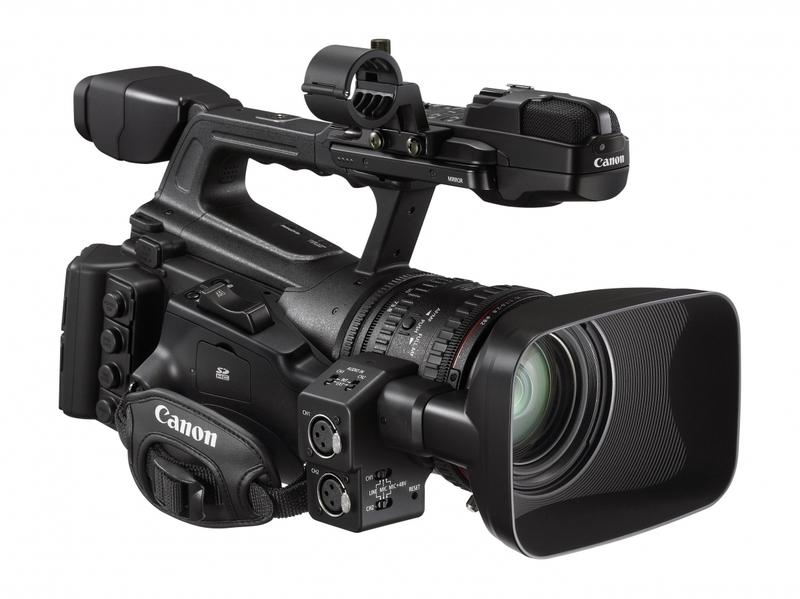 Canon's adaptation of MPEG-2 for the XF305 Professional Camcorder, named the Canon XF Codec, ensures the widest compatibility with existing industry infrastructure and non-linear editing (NLE) systems. And by using an MXF file wrapper, video and audio can be wrapped in a single file along with important metadata. The codec's 50Mbps constant bit rate provides the bandwidth needed to capture the XF305's superior resolution and color in spectacular detail. The XF305 supports the highest HD quality, with Full HD 1920 x 1080 resolution, up to 50Mbps bit rate and 4:2:2 color sampling. 4:2:2 color sampling provides twice the color resolution of HDV and other codecs that use 4:2:0 color sampling. 4:2:2 provides ultra-fine transitions in tone and color and maintains the highest quality image for use in post production processes such as chroma keying, color grading, advanced compositing and effects. Unlike other camcorders using proprietary memory systems, the XF305 records to cost effective and readily available Compact Flash (CF) cards. The camcorder features two CF card slots and offers versatile recording functions including relay recording, hot swapping, file copy & backup, and pre-record. Newly designed and manufactured exclusively by Canon, the XF305 camcorder incorporates three native 1920 x 1080 CMOS image sensors, which deliver outstanding Full HD video recording with minimal noise. These 1/3-inch sensors enable a compact lens and body design, for greater mobility and quick shooting. Multiple recording modes, resolutions and frame rates make the XF305 Professional Camcorder creatively flexible and able to work in virtually any production environment. From the highest quality 50Mbps Full HD, to the HDV compatible 25Mbps, users will find the camcorder capable of taking on any job. The XF305 Professional Camcorder also offers a full range of selectable frame rates. You can choose between 60i, 60p, 30p and 24p settings to achieve just the look you want. The XF305 features Canon's powerful DIGIC DV III Image Processor, which provides enhanced shading, lifelike tonal gradations, new custom picture settings and lower power consumption. DIGIC DV III is also the high-speed engine which powers Genuine Canon Face Detection. On-the-go videographers will appreciate the ability to track one subject in a crowd of people. Inspired by the same high level of optical precision used in Canon broadcast and photographic lenses, the Canon XF305 Professional Camcorder incorporates a Genuine Canon 18x HD L-Series lens that features a wide and impressive zoom range of 29.3 - 527.4mm (35mm equivalent). The lens incorporates High Index - Ultra-low Dispersion (HI-UD), Ultra-low Dispersion (UD) and aspherical elements to minimize chromatic aberration while delivering a resolution of 1,000 TV lines. The XF305 also incorporates a newly designed SuperRange Optical Image Stabilization system (lens shift) with three modes: Standard, Dynamic and Powered. Slow and Fast Motion Modes allow the XF305 to record a different frame rate than the playback frame rate, resulting in either a fast or slow motion effect during playback. Since the camera is recording real frames and modifying the playback rate, there is no quality loss and maximum image quality is maintained. The XF305 sets a new standard for ergonomic design in compact pro camcorders. It is designed from the ground up to maximize handheld shooting comfort and usability. Controls are ideally placed making the camera feel like a natural extension of the operator's body. Additionally, the XF305 features a redesigned layout to make using the camcorder highly intuitive. New users and users switching from other products will find the button layout, camera menu system and camera controls immediately familiar. A 4" 1.23-megapixel LCD monitor provides a large, accurate area for critical focus confirmation and approximately 100% field of view. The display is freely rotating--able to open on both the right and left side of the camera body. The display also features an additional 35° of forward movement past normal position. The XF305 features a 0.52" 1.55 Megapixel Color EVF and approximately 100% field of view coverage for comfortable viewing and accurate judgment of composition, focus and color. The angle of the viewfinder is adjustable for additional user comfort and when using the LCD display for monitoring. The EVF can be used as a cheek pad to ensure three points of contact when hand holding and maximizing stability. This makes the camcorder much easier to manage during extended recording periods and long days of shooting. Users of the XF305 have full manual control of all camera functions to adapt to both technical and artistic challenges when shooting. For maximum customization, users have access to Custom Picture Settings, Custom Functions and Custom Display Options to tailor the camera to match their creative and production needs. Any combination of these items can be saved to an SD memory card for easy setup and matching of multiple XF305 and XF300 camcorders. The XF305's operation can be further fine-tuned through the use of custom functions. This allows the camcorder to truly match your shooting style. A total of 12 unique items can be adjusted, including: Shockless Gain, Shockless White Balance, AE Response, Iris Limit, Iris Ring Direction, Focus Ring Control and Character Record. And for quick access to commonly used functions, the XF305 features 13 customizable control buttons. The XF305 uses Material Exchange Format (MXF) for its file structure--an internationally standardized container format for the exchange of video and audio material. Using the MXF format, video and audio can be wrapped into a single file along with important metadata. With MXF, the XF305 will not only benefit from the highest level of compatibility with NLE systems, but also with high-end network systems used by many networks and production studios. Aside from providing the professional user with complete control over the image, the Canon XF305 also provides complete creative freedom when it comes to inputs and outputs. It features industry standard HD-SDI output, genlock input and time code input/output terminals (BNC style), making it ideally suited for multi-camera or 3-D productions. Also included are the same connections found on the XF300: HDMI, Component, and Composite output, as well as USB and LANC terminals. A stereo microphone is incorporated into the XF305, as are two XLR audio inputs with +48V phantom power. The built-in microphone provides exceptional audio in fast-paced situations while the XLR inputs provide connectivity to external microphones and other professional audio devices. If you choose, the built-in microphone and XLR input can be used simultaneously. Videographers depend on these features to confirm accurate exposure and color levels during the capture process. Typically only found on expensive external units, the Canon XF305 camcorder has a waveform monitor and vectorscope built right into the camera. The waveform monitor shows a detailed view of overall image brightness and RGB components. The onboard vectorscope provides real-time image hue and saturation analysis, making it easy to check color balance and see the result of white balance adjustments. The XF305 is compatible with Canon's new BP-955 and BP-975 Intelligent Lithium-ion batteries. These batteries communicate remaining running time (down to the minute) and wear data back to the camcorder, so the user is well-informed at all times. On the outside of the battery, four LED lamps allow battery life to be viewed quickly when in the field. Additionally, the camcorder is compatible with existing Canon BP-900 series batteries. Batteries can also be inserted and removed while the supplied AC power cable is connected. For applications such as storyboarding, continuity and publicity shots, the XF305 offers the ability to capture 1920 x 1080 still images. Photos may be captured to an SD memory card during the time of recording, as well as "frame grabbed" during playback.